This demonstration was presented at World Haptics Conference 2011. 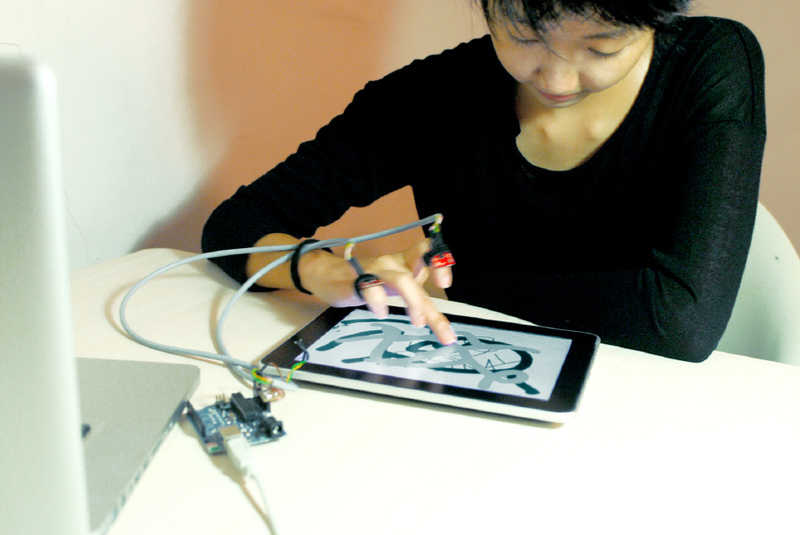 We showed a finger worn accelerometer interface for modifying the stroke attributes while drawing on a touch surface. We support input through finger touch and pen. In example, a scroll movement with the index finger (or pen) changes the stroke width, and shaking the hand is translated into an undo command. This interaction technique allows tool modification in parallel of seamless tool usage. The acceleration data are transferred via an Arduino Boards into the serial port of the tablet pc, where a processing application is classifying and interpreting them into tool modification commands. This work was done in collaboration with Mathias Wilhelm (DAI Labor Berlin) and Martin Tomisch (Sydney University). This project was a collaboration with Mathias Wilhelm and Martin Tomitsch.